That this particular woman broached this subject could move the focus immediately to how public policy treats it. In an interview on ABC’s “Good Morning America” and in her new memoir, “Becoming”, Michelle Obama discusses the difficulties she and the former president encountered in their efforts to start a family. 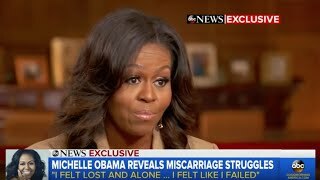 After Michelle suffered a miscarriage a couple of decades ago, the future first couple used in vitro fertilization to achieve the births of daughters Malia (now 20) and Sasha (now 17). The usually reserved Mrs. Obama provided these intimate details in an effort to dissolve the far too prevalent cloak of silence on these intimate subjects. She’s right. Miscarriages do happen. According to the American College of Obstetricians and Gynecologists, anywhere from 10% to 25% of all recognized pregnancies will end in miscarriage. And the biological clock really is real. Women are born with about 2 million eggs, far more, of course, than they’ll ever need. But as women age, their egg inventory is steadily depleted. And the remaining eggs increasingly lose their viability. According to the Centers for Disease Control, over 6 million American women between the ages of 15 and 44 have difficulty getting pregnant or carrying a pregnancy to term. When women like Michelle Obama, who’ve devoted their 20s and early 30s to the creation of a professional career, discover the family that they postponed isn’t so readily available, in vitro fertilization (IVF) often enters the picture. The mother-to-be takes medications to enhance fertility. Mature eggs are collected from her ovaries and fertilized in a laboratory. One or more of the fertilized eggs are placed in the uterus, in the hope that at least one will implant there. Then there’s about a 2 week wait, to see if any of the eggs have successfully embedded in the uterus. During the collection/fertilization phases, excess fertilized eggs can be frozen for future use, in the event that none of the “fresh” eggs successfully implant in the uterus. What’s the cost of in vitro fertilization? An IVF cycle that utilizes “fresh” (i.e., unfrozen) eggs, can cost from $12,000 to $20,000. Subsequent cycles, using frozen eggs, are generally in the $5,000 range. Insurance coverage for the process is rare. The success rate for IVF depends on a number of factors. Age of the prospective mother, her reproductive history, whether the infertility is related to the mother or father, and lifestyle factors all play a role. The live birth rates for IVF cycles using frozen eggs are slightly lower. The World Health Organization has recently classified infertility as a disease, which might lead to future insurance coverage for infertility. Laws proposed to require insurers to cover infertility have stalled in Congress, but the record number of women in the new Congress might lead to reconsideration of that legislation. “Our culture is very hush-hush about reproduction and infertility in particular, it reaches to the very heart of our self-image, who we are and how we see ourselves. Many women still have that feeling that they are barren if they can’t perform this basic thing. And for men, they feel that it reflects on their masculinity, their basic manhood” said Richard Paulson, past president of the American Society for Reproductive Medicine.